Mali Mish - Day 193: City of Marfa and its Mystery Lights. Since today is Monday, we are expecting this town to really slow down. Nearly the entire town is deserted with the weekenders being gone and we have pretty much the whole place to ourselves. We have been doing several consecutive days of transiting, these couple of quiet days at El Cosmico is just what we needed. There are a half dozen of these wagons with big, pneumatic wheels right next to the parking lot so that guests can haul their gear into their units for their stay. 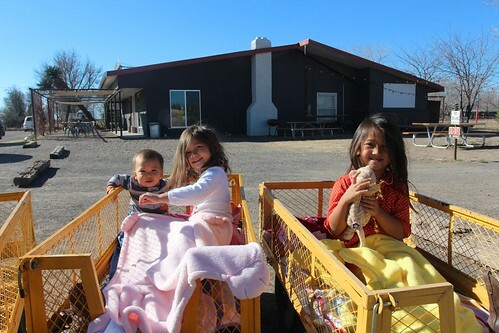 The kids loved using them to take rides on the property as we explore. Cowboy boots have become a favorite accessory for the girls as you might have noticed in a few of our recent posts. 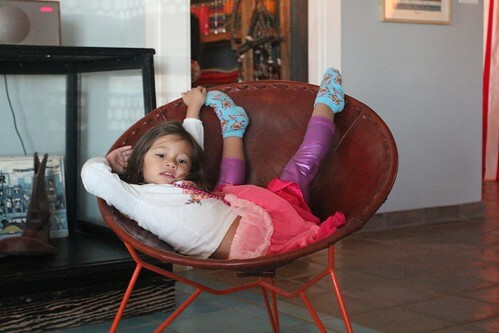 Mila made herself a little more comfortable than she probably should in a leather clam shell chair in the lobby. 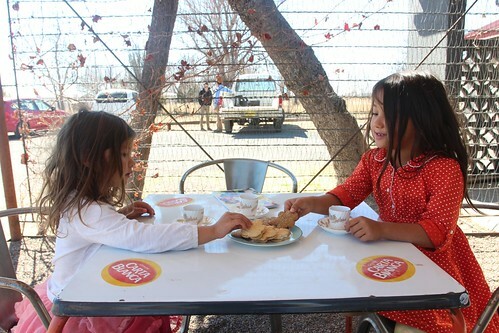 One of the girls many highlights of relaxing at El Cosmico today was the tea party they had on the patio. They have been asking about having a tea party with cookies ever since Marlene bought the cups and saucers 2 weeks ago in the Garden district of New Orleans. In reality, they were more excited about the Trader Joe’s maple leaf cookies. 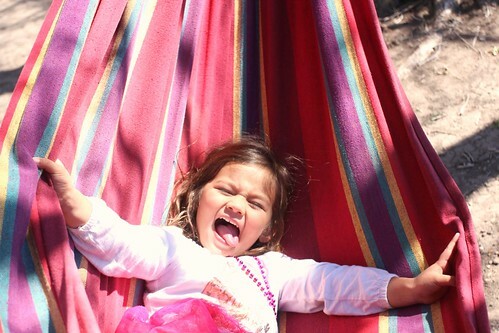 At their request, we made another visit to the hammocks. The brisk early spring air coming across the high desert was a little chilly. 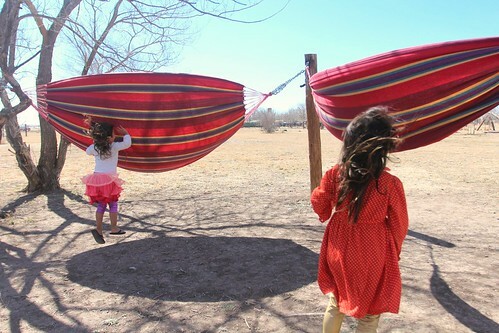 But the warm sun shined on us unobstructedly through the clear western Texas sky made the hammocks a perfect place to relax. If you haven’t noticed, Mila is the silly face maker in our family. She especially likes to stick her tongue out when she is doing something fun. We did manage to get out of El Cosmico to go into town for a bit. Our first stop was lunch. It was difficult to even find a place that was open on a Monday. 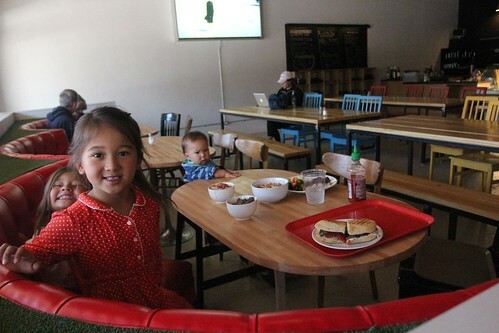 We finally found a little cafe right on the main drag, Highland Street, that had decent food. Probably not good enough for me to recommend it to anyone though. After lunch, we took a walk down Highland Street which extends from the footsteps of the Presidio County Courthouse. Across the street is the historical El Paisano Hotel that opened back in 1930. Back in the 30s and 40s, this is where local west Texas ranchers would come to trade and sell their herd. 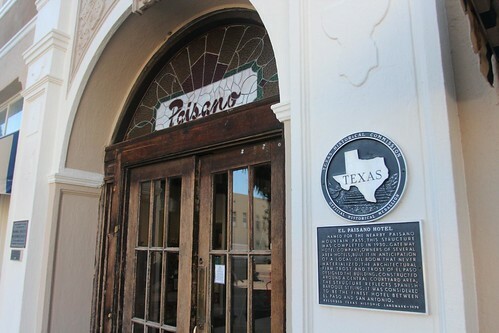 In 1956, during the filming of the movie Giant, featuring Elizabeth Taylor, Rock Hudson and James Dean, the Paisano was used as their base of operations for months. 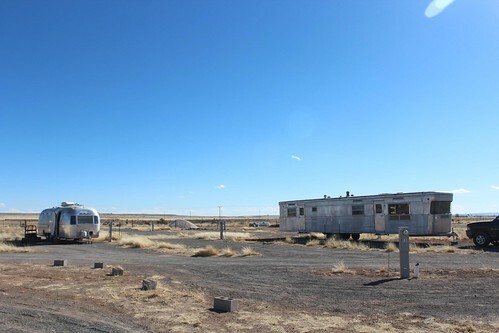 Many other movies have been filmed here such as the recent Oscar winning films There Will be Blood and No Country for Old Men. 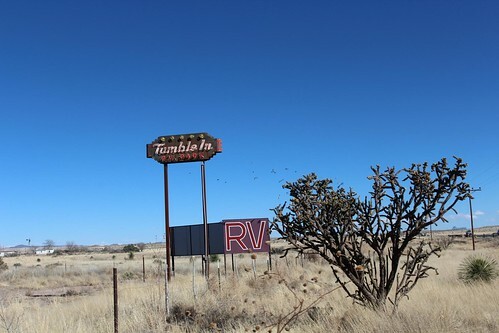 We did some more driving around Marfa and came across a new RV park called the Tumble In. 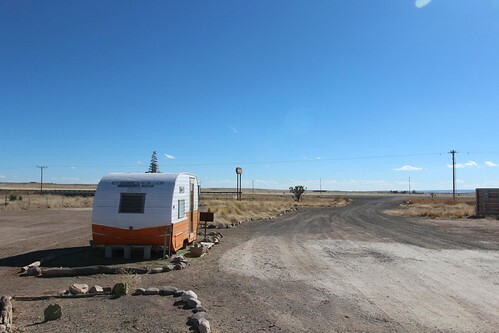 We had been recommended this RV park by a friend on Instagram although we had already had our minds set on El Cosmico. 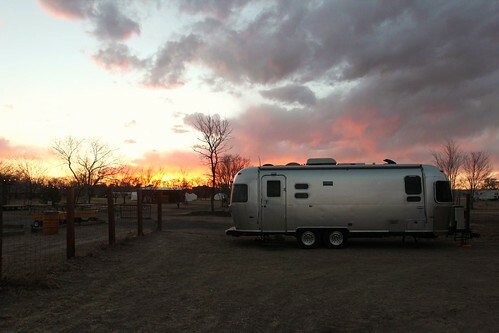 Tumble In is managed by an onsite manager who lives in an Airstream and helps out guests on the property as needed. A small vintage canned ham trailer is at the entrance so visitors can self check-in when they arrive. For $29 a night, you get a full hook up site. If you’d like to stay longer, you can get a monthly spot for as little as $375 plus electricity. We decided that later this evening we are going to come out to the desert to try out luck with the Marfa mystery lights. Because of its popularity, the county has built an observation platform complete with restrooms and telescopes for tourists to get a better view.  It is about 15 miles east of town but since there are no street lights, we came out here to see where it is so we wouldn’t get lost later this evening when we come out here. 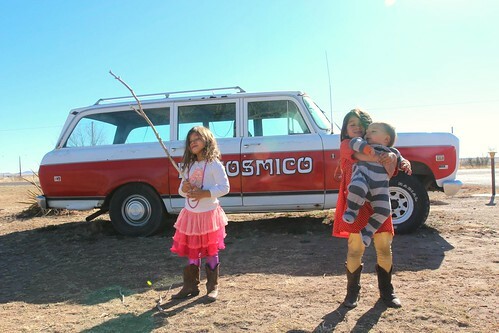 We headed back to El Cosmico to eat dinner and wait for the sun to set so it will be dark enough to see the lights. Some clouds rolled in and made for an incredible west Texas sunset. It is really hard to get good photographs of the lights since they just appear as dots on camera using a long exposure. There is definitely something mysterious about them since they seem to just hover and dance around in the middle of the desert. Some have theorized that they are just reflections from headlights on the freeway. But how then can one explain the documentations of sightings dating back to the 1800s before automobiles existed? We sat there in the pitch black night staring at the bouncing lights in the distance and got a strange feeling in our guts. Somehow, it felt like we were getting away with witnessing something we are not suppose to see. We left after a half hour of being in surreal state of mind and called it a night. 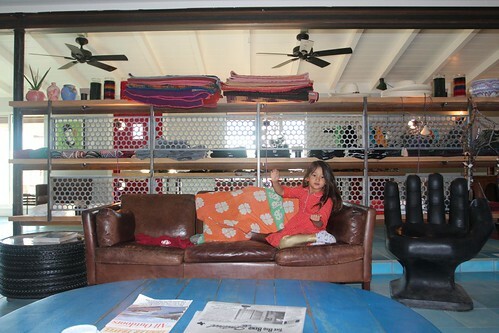 Tomorrow, we leave Marfa and Texas and head into New Mexico. 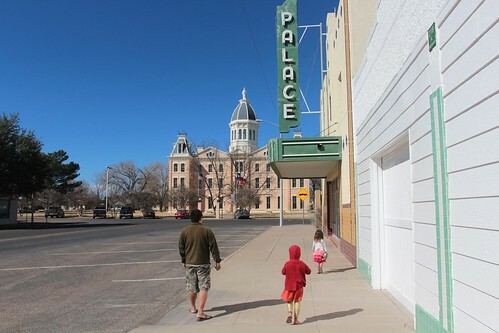 6 Responses to Day 193: City of Marfa and its Mystery Lights. Sounds like a pretty cool day. Especially the tea party! Marie, it was great meeting you! So glad you came out! Such a cool little place, it’s in our must visit list for sure!! Interesting about the lights, we have something like that near us in Upper Michigan called the Paulding Light so it would be crazy to see this somewhere else too! We visited there not too long ago. Such a fun place. 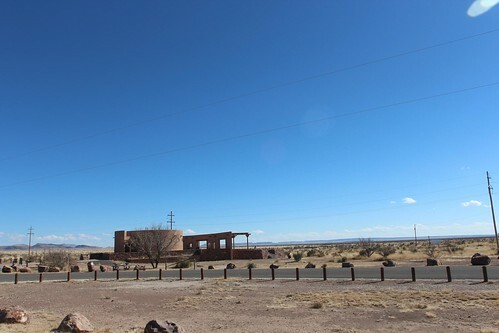 Another great place is fort Davis Texas nearby. We stayed at the Indian Lodge but they have campsites. 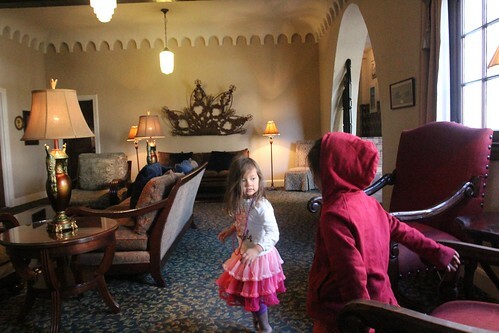 Your kids would love the McDonald observatory if you get the chance to go back.